The 35th California International Airshow was held on Saturday 26th and Sunday 27th September at Salinas Municipal Airport. Over the years, Salinas has been able to attract top display teams and acts; such as the Thunderbirds, Blue Angels, Snowbirds and the Red Arrows. 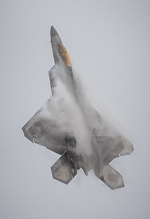 This year was no different, with the organisers managing to book the United States Air Force's F-22A Raptor and the Royal Canadian Air Force's CF-18 Hornet demonstration teams. Keith Meachem reports from Salinas Municipal Airport. The show is run by the local community, with all proceeds going to charity. Over its 35 years, the airshow has donated over $8 million dollars to charity. The show has just two permanent members of staff to oversee the event but they are ably backed up by a team of over a thousand volunteers. 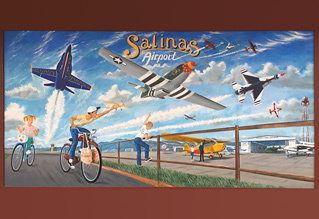 Salinas Municipal Airport is located just off Highway 101, about a two hour drive south of San Francisco. It's used primarily for general aviation, with a 6,000 ft asphalt runway. This makes it ideal for an airshow as it does not have to work around scheduled flights and has a runway that can handle fast jets. Gates to the show opened at 9am with the four-hour display flying starting at 12pm. Thanks to the good organisation, clear road signs and the efforts of the volunteers, getting into and out of the show was hassle-free. 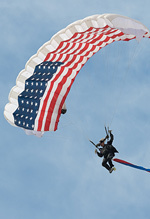 This year Skydive Monterey Bay started the show, parachuting in both the Canadian and US flags; with respective national anthems being played. The only pause in the flying programme (on both days) came when the visiting Cal Fire OV-10A Bronco and Grumman S-2T Tracker were tasked to go and tackle a wildfire. The USAF, US Navy and RCAF all sent aircraft to the show. 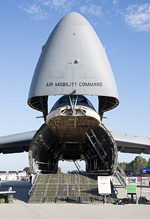 The USAF's C-5M Galaxy and C-130J Hercules were open to the public; allowing the crews to show people around their aircraft and a chance for them to talk about what they do. WWII warbirds were well represented with several P-51s, B-25s and a Corsair taking to the air. Full use was made of the flight line throughout the display, allowing the aircraft to make topside passes to the crowd. Of note was Mike Couche's rare P-51H Mustang. With only a handful of P-51Hs still in existence, it was great to see a late model example being displayed. John Ward's immaculate B-25J "Old Glory" was just stunning. Seeing its highly-polished aluminium airframe gracing the Californian skies made it one of the standout acts of the show. This show was the last public display of the Canadian Forces CF-18 demonstration team for the 2015 season and also this year's display Pilot Capt "Cheech" Beaulieu. This year the CF-18 had been specially painted to commemorate the 75th anniversary of the Battle of Britain, and honour the contribution made by 112 Canadians. Unfortunately, the commemorative schemed airframe failed to make the show due to ongoing serviceability issues. "Cheech" still put on a superb high energy, dynamic display pushing the Hornet to its limits. 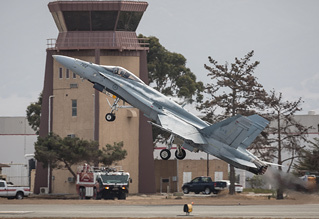 Due to the length of the main runway at Salinas, the F-22A demonstration jet had to operate out of Moffett Field. The Raptors used on both days were airframes from Nellis AFB. 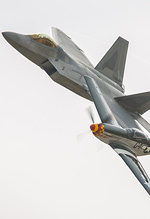 This year's display pilot Maj John "Taboo" Cummings yet again showed why the Raptor is still one of the top combat and display aircraft in the world. 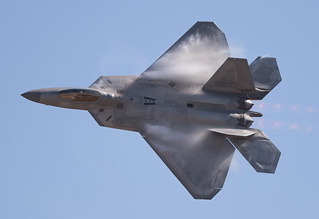 With its raw power, thrust vectoring and design it is able to perform manoeuvres no other Western aircraft is still remotely capable of doing. Even after all these years, the plane continues to amaze the crowds below. Originally the USAF Heritage Flight was to comprise the F-22A formating on the Planes of Fame P-38J Lightning. By the time of the show, the P-38J had been replaced by the P-51D "Wee Willy II". It's always a privilege to see the Heritage Flight, and the sight of the Mustang and Raptor together made it just that bit more special. 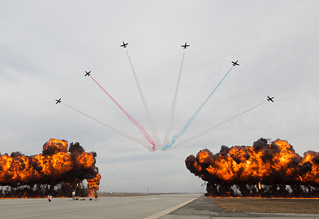 The Patriots Jet Team closed the show on both days, taking to the skies in their distinctive L-39 Albatros jets. It's the largest civilian aerobatic team displaying in North America (that's if you exclude the Breitling Jet Team who are in the US currently). The pilots are all ex-military display pilots, with pilots having flown with the Thunderbirds, Blue Angels or Canadian Snowbirds. With so much experience and high performance jets, it was no surprise the team put on a superb demonstration of both their piloting skills, and what the L-39 is capable of. From a photography perspective, the show was challenging. The airshow crowd is sited to the north of the main runway facing towards the south-east. This meant shooting into the sun until mid-afternoon. Space on the crowd line was limited due to all the chalets, box seats and VIP tents. To give credit to the organisers, they did provide space near the midpoint for spectators to sit - you just had to get there early to get a spot. Finally, the combination of distance between crowd line and main runway - alongside the heat haze - made photography of the aircraft on (or near) the ground challenging. The show exceeded my expectations with its relaxed atmosphere, organisation, great facilities, plenty of food and drink outlets and many things to do away from the crowd line. The flying was brilliant. From 5th generation fighters to warbirds to aerobatic displays there was definitely something for everyone. A special mention has to go to show commentator Rob Reider. It's always refreshing to have someone commentating with a passion for the aircraft and aviation history and who is able to share that knowledge effectively with the crowd.